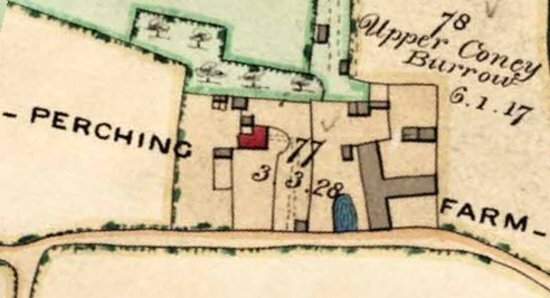 Perching Farm as it was in 1842 — Perching Manor is the building shown in red, the duck pond is shown in blue and the farmyard is to the right. The large T-shaped building is Perching Barn with stables immediately due north and the grain store/cattle shed to the north east. Until relatively recently, Perching Manor was a farmhouse and the area to its immediate east was the farmyard. There had been a farmyard in that location for hundreds of years. Farm buildings come and go, of course, but the largest building dates back to the eighteenth century. Houses have human residents who leave a history. We know quite a bit about the history of Perching Manor itself and even of the fortified building that preceded it and of the manor more generally. But farm buildings give rise to few records. The owls, rodents and feral cats who take up residence pass through anonymously, untroubled by police, lawyers, census takers and registrars of birth, death and marriage. Thus most of what is known about the history of this now former farmyard is of recent vintage — the last eighty years or so. The largest, and most distinguished, component of the farmyard is Perching Barn. This is a Grade II listed eighteenth century building with weather-boarding on a flint base. The roof is slate, hipped at the north and half-hipped at the south. A large building today, the map shown above suggests that it was quite a bit larger still in the mid-nineteenth century. Perching Barn was a fine example of a Sussex threshing barn. It had a wide entrance in the centre of the (long) side that faced west and was high enough to allow a threshing machine to be positioned and operated in the centre of the building. Sheaves of corn were loaded from both sides of the machine and the grain was then stored on either side of the building. Once threshed, the straw was ejected from the back of the thresher to the outside of the building. When not in use during harvest it was available for other uses — such as village barn dances and parties. 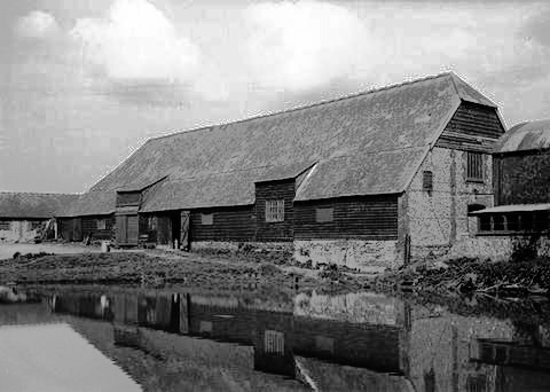 Perching Barn as it was in 1934 — the duck pond was much larger then than it had been in the mid-nineteenth century (or is today). In cold winters, it froze and was used for skating and ice hockey. The last time it froze hard enough to permit skating was in 1983. Part of the stable can be seen on the left behind the barn. To the immediate north of the barn stood a stable for the farm horses. In later years, as tractors replaced horses, it was used as a storage shed and workshop. To the north east, there was a two-storey building, with cattle pens at ground level and a grain and cattle feed store above. Feed was delivered to the cattle as required, via a chute. Calf pens and a storage shed were situated at the south end of the building. Some time during the 1930s or 1940s, a man known only as Martin lived in the lower half of a two-storey barn situated behind this building, on ground that fell away sharply towards the stream to the north east. It seems that he was ex-army and well educated, but chose to live there on an earthen floor, using old sacks as bedding. From time to time he became very ill and was moved to the workhouse at Chailey, but as soon as he recovered he would walk back to his simple home in Fulking. It is thought that his income was mainly from an army pension, but he supplemented this by chopping wood and doing odd jobs at Perching Manor for which Henry Harris is thought to have paid him 10 shillings a week. George Greenfield was the local tramp. He may have been the George Greenfield who was born in Steyning around 1884. He lived rent-free in the ‘duck hut’, an open fronted, lean-to shed located at the southern edge of the farmyard. The shed had an open front and faced Perching Drove and the pond. George walked with a stick and had a dog. He was well known around the village and on most evenings could be found sitting in the same place at the Shepherd and Dog. He was known as the ‘threshing machine feeder man’ as this was his job when the contractor arrived in the district for the autumn/winter threshing period. 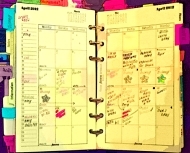 In summer he did no work at all. Like Martin, his bedding was sacking and he hung sacks across the front of his hut to keep out the wind and rain. He cooked on a brazier and in winter he moved this inside the hut to provide heat. However, this meant that the hut filled with smoke, as there was only a small gap just below the roof for it to escape through. When he became ill, George was also taken to the workhouse at Chailey, but once recovered, he too always walked back to his shed, where he eventually died. As farming became more mechanised, the barn was divided up. Half was used as a grain store, whilst the other half became a milking parlour and dairy. Later, Brian Harris, who was the farmer at the time, switched to arable production only. This decision was brought about partly because it was becoming impossible to find a cowman prepared to work the unsocial hours associated with livestock production and partly because of changes entailed by European Union farming policies. As a consequence, the barn became largely redundant. 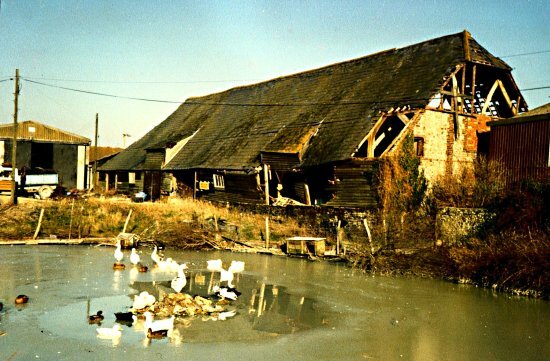 Perching Barn in 1987 after the great storm — the ducks may not have noticed, but the storm did serious damage to the barn. In 1984 the Crown sold Perching Manor Farm to the National Freight Corporation. The latter sold it to Brian Harris in 1986. 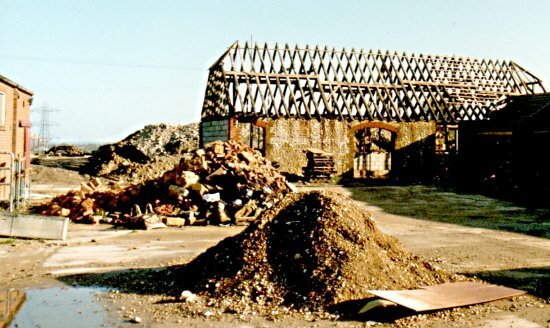 In the same year, Terry Willis, a developer trading as Sussex District Estates, came to Fulking and started buying redundant farm buildings for conversion to private dwellings. This was not straightforward as most had agricultural restrictions attached to them, but once these were lifted and planning permission had been obtained, the development programme began. 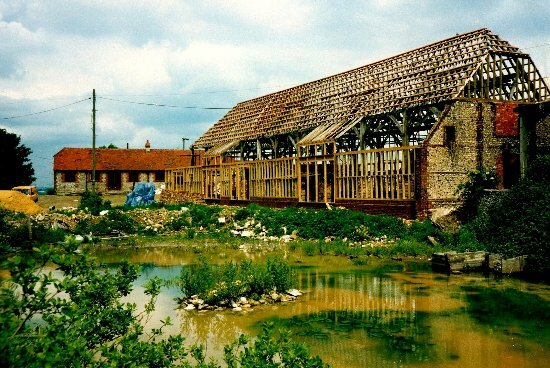 In 1987, Brian Harris sold his redundant and derelict farm buildings to Willis. The sale included the barn, the stable and the grain store/cattle shed. Terry Willis, with the aid of an imaginative architect and some competent builders, converted these dilapidated buildings into attractive private residences during the 1990s (see the appendix below). Perching Barn in 2007 — to the left, Stable Cottage; to the right, The Granary. This entry was posted in Farming, Listed Building, Local History, Local Planning, Perching Drove, Shepherd and Dog, Topography. Bookmark the permalink.